Unable to pay for the third ticket, while Mariana’s two children see a film, she sits on the sidewalk outside, waits, and comes up with a plan to provide for her family. Abandoned in New York City just two weeks after the three arrive from Colombia to meet up with Mariana’s estranged husband who flees to Miami for a job and greener pastures without his wife and children, Mariana (Sangre de mi Sangre actress Paola Mendoza) realizes that in order to survive and stay off the streets she must turn to the city’s garbage. Rooting out recyclables, which she pushes around in a cart on a daily basis to turn into enough money to get a room for the three at a nearby flophouse, Mariana, her ten year old son Gabriel (Sebastain Villada Lopez) and six year old daughter Andrea (Laura Montana Cortez) spend their first summer in the America searching not for the dream of a traditional middle class life but just the means to get by. 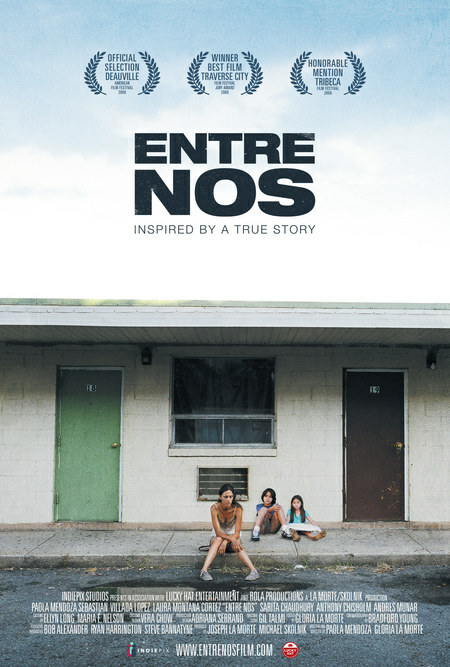 Written and directed by Gloria La Morte and lead actress Paola Mendoza who sought cinematic inspiration based on the true struggles endured by Mendoza’s mother, the award-winning film-festival favorite Entre Nos is a gritty but ultimately touching testament to the maternal drive to do what it takes to keep her children safe and secure. Concerned that her children will be taken from her at every turn, whether it’s injury or hunger that threatens them on a daily basis, Mariana evolves from a devoted and deluded wife to the man who’s forsaken them into a fierce protector via Mendoza’s skilled, heartrending portrayal that’s alternately filled with despair, warmth, and love. Filmed with compassion and realism, La Morte and Mendoza’s exceptionally timely Entre Nos manages to touch on far more than simply the issue of immigration in its riveting eighty-one minute running time as it’s above all a familial story that – regardless of ethnicity – also subtly champions a woman’s right to choose what’s best for herself and her children in these United States.